It’s easy to play up the bittersweet moments in an American Graffiti­-style end-of-an-era night of partying. However, if you can find the best parts in the hangover than you’re really onto something. Buckle up, because it is going to be a heck of a party in Masaaki Yuasa’s The Night is Short, Walk on Girl, which screens during the the Japan Society's Japan Cuts this Saturday night. It starts with a wedding, but the after-after-party is where it’s at. Than these Kyoto college students are off to enjoy the night life of the nocturnal city that apparently puts both New York and Las Vegas to shame. The Senpai (upperclassman) would like to chat up his crush, an underclassman known simply as “The Girl with Black Hair,” but he is painfully shy, He gets ribbed by his friends, but frankly they are even worse, especially Don Underwear, so-called because he pledged never to change his under-garments until he finds the mystery woman he fell in love with during a brief chance encounter. If the logic of his strategy escapes you, just backburner that thought for now. The Senpai will follow the Girl with Black Hair as she struts through the college district nightlife like an animated Holly Golightly. It would be a bit stalkerish if he weren’t so ineffectual. They might actually be meant for each other, but first the Girl with will get a lesson in exotic cocktail history, assist the Puck-ish God of the Used Book Market restore cosmic balance to the free flow of used books, and step into the lead role of a guerilla theater troupe’s floating production. Kyoto looks like a heck of a fun city and the Girl with is an absolutely charming companion to share it with. There is probably more alcohol consumed in Night is Short than a typically sloshed Hong Sang-soo or Thin Man movie, but there is more to it than that. In fact, the wild night catches up with them, sending nearly everyone to their sick beds to nurse colds and flus, except Girl with. As she starts tending to her old and new friends, certain aspects of the night come into sharper focus. 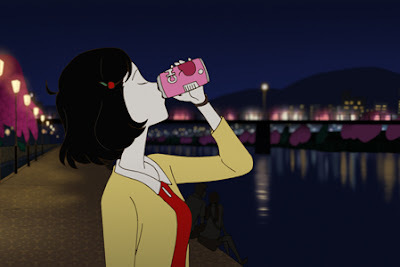 Night is Short is a rarity among animated films, because it maintains a light, whimsical vibe, while not including any objectionable material, but it clearly has an adult sensibility. You need to have lived through a few nights like this, albeit without the surreal flights of fantasy, to fully appreciate the film’s intoxicating vibe. Yuasa’s style is also rather mischievously flexible. He slides up and down the scale from representationally realistic anime to dayglo candy-colored abstraction, but somehow he maintains a consistency of tone and attitude. It is just a trip to take in all the visual confections.